This will be the last post. Hope the following information helps anyone deciding to work/travel in India. Thanks for reading. Job Opportunities: Infosys definitely offered this. Not only is this for the IT training and the great facilities in Mysore, but also for being able to meet all the Indians, Brits and Americans. A student from Surrey also got in contact with me a few months back, he will be working for an Indian engineering company for his placement year. Traveling: Without doubt, India is a great place to go traveling, mainly because of the low expenses and has so much culture. Being located just near South-East Asia also opens up travel destinations. Scooters & Motorcycles: Most people would be petrified about driving in India, understandably so (YouTube). But if you start slow on a scooter and have a few years driving experience, it really isn’t that bad. Granted, the road conditions aren’t great with the unmarked bumps, cows, pot holes, black cows, the odd dangerous lorry driver and the almost impossible to see black cow at night; but there are plenty of people driving along as part of their daily routine in the organic, slow, chaotic traffic. Personally I’m really going to miss flooring Andrew’s Apache going up Chamudi hill. He never minded me revving it, and would say “Knock yourself out!”. 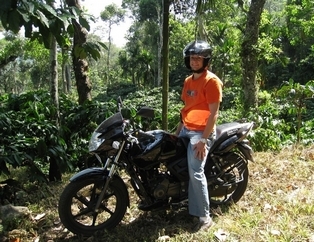 The closest I got to crashing was to a black cow at night in a dimly lit road in Mysore. As it was crossing the road at right angles to me driving towards it, I was too late too countersteer around it (anything with two wheels countersteers: Wikipedia, YouTube 1, YouTube 2) … but luckily the cow turned it’s head and I missed it by a whisker! It wouldn’t have been that bad anyway, I was only going about 15mph and I had my helmet on. But please note: avoid driving at night down dark roads, and if you do, make sure you know where the pot holes are in the dark (you can get used to it after a while). Food: The delicious food! Most of my Indian colleagues find battered fish and chips at work so bland, and rightely so when one compares it to Chicken 65, Butter Chicken, Mangalore Prawns or a mouth watering Hyderabadi Biryani. Weather: We really couldn’t complain about the weather. Very sunny and warm, it was perfect conditions to head out and scooter around. Part of me wants to put this bullet point in the worst section because it got too hot sometimes and I really hated the feeling of being dehydrated– it has definitely made me appreciate playing football in the warm rain the other day. Delhi Belly & Malnutrition: It did take some time for everyone’s digestive system to “adjust”. It wasn’t so bad I had to go to hospital but it was an annoyance. I really missed having a nice cold glass of milk there too, not as prevalent as it is here in the West. Dust, Dirt & Public Infrastructure. One thing that was visible was all the dirt on my clothes from the smog of the Bangalore traffic after being out of an hour or so. What was worse is the thickness of the air that you can feel at rush hour traffic. I’d advise buying a face mask. Internet Access: It is really annoying when one is unable to stay in touch over the internet which can be a challenge sometimes. I’d recommend buying a USB stick that can access high speed Internet over the mobile network as soon as you arrive. & 5. I can’t really think of anything else, it really wasn’t that bad. Due to training winding up in the J2EE stream we’ve not really had a chance to go traveling anywhere far. We’ve been learning about threads, RMI, JSP, advance JDBC and more. During weekends we’ve had time to enjoy Mysore. There are good places to eat, nice scenic hills to motorbike up, play Virtual Tennis on the PlayStation 3 on big LCD screens for 50 Rs. an hour, get clothes tailor made and make most of the facilities on campus. 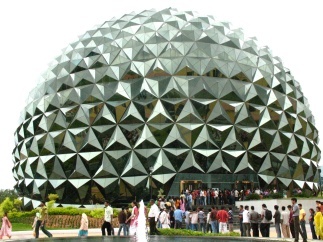 known as the “Origami Building”. Click to Enlarge. 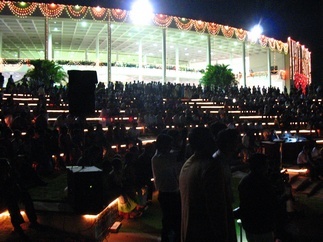 The amphitheatre was used a few weeks ago to celebrate the town we are currently living in, Mysore. There were some folk performances amongst other things, I didn’t stay that long. The whole of food court one was light up like Christmas lights. A few days ago our current chief mentor and former CEO Narayan Murthy (or ‘NRN’ as he is known here) made a speech here too. I noticed a large proportion of his speech was emotional. I remember he talked about courage, persistence, working well in a team, working across cultures, dealing with people smarter than you and not as smart as you. We later saw NRN at a table a feet away from us at the floating restaurant for dinner. Our batch member and sharp minded Marco got interviewed by the BBC. The clip contains many of the UK batch working hard in class and playing table tennis afterwards. I’m in the clip at 1 min 32 sec climbing the steps to the GEC with Marco. As part of the Dasara festivals, a day is taken to see the spiritual side in daily tools by worshiping them. This includes tools used in trade such as computers and vehicles. Cars on the road were seen with flowers decorated over them. 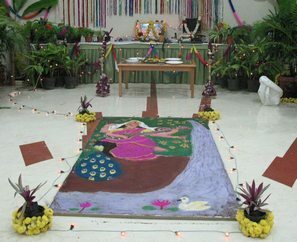 At work, there was an image created with coloured sand/powder of a certain goddess related to this ritual. On the day of this celebration a box of Indian sweets was given to all trainees at work too. 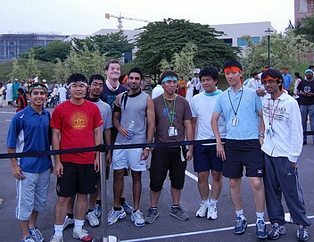 There was a fun run last Tuesday inside the campus to raise money for the poor in India. 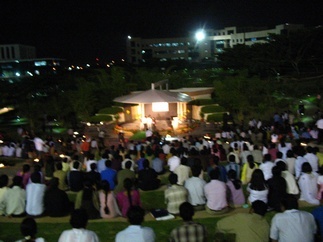 About 1,000 employees at the campus took part. There were two competitive men and women races and a general fun run for everyone else. A friend who won the women’s race got some suprising attention at the grocery store the very next day. She won a nice iPod nano too. 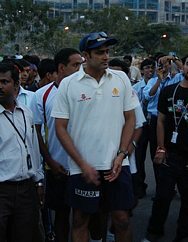 The Karnataka state cricket team also showed up, including a former bowler of the Indian national cricket team, Anil Kumble. I ran beside him for a few seconds just for kicks! Last week was pretty intensive due to a team project assignment and a class test. Some memorable analogies include, “It’s like being in finals week!”, and regarding the information intake, “It’s like drinking water out of a fire hosepipe!”. Both the test and the project went fine. This week should not be as hectic. We have moved onto learning about databases. I got my first mosquito bite today, not bad going since it has nearly been four weeks here. I haven’t mentioned about the creepy crawlies here … well there aren’t that many really. There is this section by building two where a few of the UK students are living that has: a) lots of bats flying around at night and b) a swarm of dragon flies during the day and night! At first I thought the bats were birds … but after paying closer attention and asking, yes they are definitely bats. They literally fly past you, especially at the cark park next to building two where Jason parks his scooter. 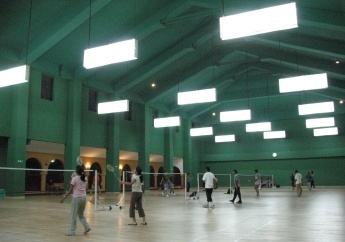 Photo: Played some badminton this evening. One thing I really like is the layout of the lights: they are placed in between courts as opposed to on top of the courts. This makes it easier to smash since you can see the shuttlecock and not be blinded by the light. We’ve been kept busy past few days. We’ve had two tests, both went fine. Although writing 35 odd programs in 4 days might seem boring, I actually enjoyed the refresher because I learnt it about 2-3 years ago now. One of the lecturers we had the past few days really burnt a lot of calories while presenting slides! He was very eager to answer questions and was passionate about teaching algorithms. I remember watching a BBC documentary on happiness once. There was one idea presented that a person would be less happy the greater the triangular distances between work, leisure and shelter. Bearing in mind all the greenery and grand shaped buildings here, I guess Infy aim to make their workers here happy and productive. Well, time is flying here and soon I’ll be joining friends back home with the long and expensive commute into London every morning. Good of luck to those of you who are about to start it, hope it isn’t as bad as people say it is! 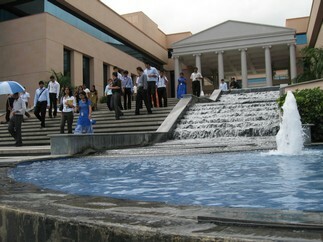 Photo: The multiplex theatre on campus. There is usually a long line during the weekends when the tickets go on sale.